Wood flooring is a common choice these days in residential construction. 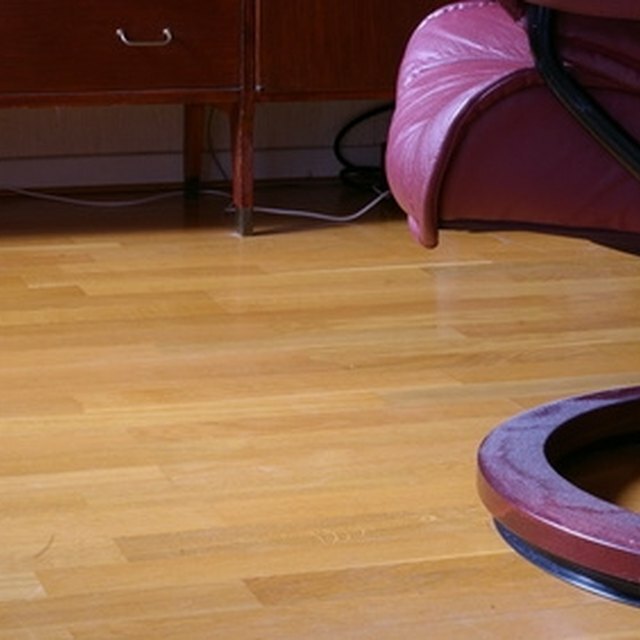 Most of the wood and wood grain laminate floors in use today fall into a category known as engineered hardwood flooring. This designation indicates that the flooring is not made from solid hardwood, but is engineered from layers of hard veneer or from a wood composite product in the case of laminate floors. Wood paneling has been a common choice for wall covering for centuries in many different styles. Engineered flooring can be used to create this effect on your walls. Engineered wood flooring can be used for wall paneling. Remove the baseboard and crown molding from the wall. Clean the wall with a rag and vinegar and water to remove any oil and dust. Allow the wall to dry completely. Cut the tongue from the edge of enough flooring planks to fill the first row along the left edge of the wall from floor to ceiling. Apply a layer of flooring adhesive to the back of the first plank with an 1/8-inch notch edged trowel. Scrape along the back of the plank to create an even layer of adhesive. Press the plank against the wall, with the cut edge aligned with the left edge of the wall and its bottom end against the floor. Add the next plank above the first. Apply adhesive to the back of the plank. Tip the top out with the cut edge to the left and slip the bottom end tongue of the second piece into the groove on the top of the first piece. Continue adding full length pieces as far as possible. Measure and cut a piece to fit between the last full piece and the ceiling and fit it in place. Drive two 2-inch pin nails through each piece in this first row to anchor them in place until the adhesive sets. Start the next row of planks with the off-cut piece from the top plank of the first row. Apply the adhesive to the back and press the tongue along the left edge of the plank into the groove along the right edge of the first row. Continue adding planks as per the first row, fitting each piece first into the piece below, then sliding it left to fit into the row before. Continue adding full width rows in the same way. Measure from the last full row to the far edge of the wall. Cut the groove edge from enough planks to fill the last row, cutting them to width to fit from the last row to the right edge of the wall. Use locking pliers to pull the nails through the back of the baseboard and crown moldings to preserve the face. Realign the base board and crown moldings at the bottom and top of the wall and nail them in place with the pin nail gun.